3D Printing Pen can help Kids developing artistic skills, spatial thinking, and can be a great creative outlet that engages their mind as they create. 1. It is strictly forbidden to knock other hard objects with the tip of the pen. 2. It is strictly forbidden to insert the foreign object into the feed hole or the tip of the pen. 4. Do not touch the tip of the pen and the heating parts when used. 5. Please place it in a safe position after use, in case the child contained in the mouth or touch to play. Creativity – 3D art pens help kids developing artistic skills, spatial thinking, and can be a great creative outlet that engages their mind as they create. Stable performance: The performance is more stable, Safety and reassuring, be aimed at the child design the color is more refreshing, the appearance is more lovely. Let your child fall in love with 3D printing. Temperature Adjustment – With display screen, LED display temperature adjustment. The temperature can be adjusted at any time. Feel free to exchange materials, feel free to switch, follow the heart. Adjustable printed consumable speed, the internal temperature of the printed pen can also be adjusted. control temperature can control the cooling rate of material consumables, better shape 3D stereoscopic works. We have taken the art of 3D printing to the next level.With adjustable operating temperature,6-speed setting for the plastic thread feeder,and compatibility with different plastic filaments. You can use it equally effectively at work and at home. 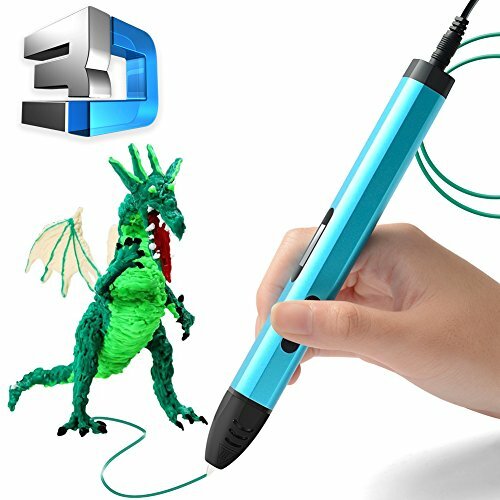 KIDS AND ADULTS WILL LOVE OUR DRAWING 3D PEN:Whether you’re an experienced artist, novice crafter,or excited hobbyist,our Drawing 3D Pen is great for people of all ages.It makes a great gift for anyone who loves tech or artsy toys. 1.Creative Design:Creativity is at the core of our design principles. We aim to help you to be creative. 2.Development Craze:People of all ages can develop their spatial reasoning and more other mind skills that can enhance their academic performance. 3.Practical:Use your 3D Pen to fix your 3D Prints, create office accessories, candleholders and more!3D PRINTING PEN can do it all! Every pen comes with 5 FREE LOOPS of PLA plastic filament! 4.Learning:3D pens enable children to unlock and enhance your creativity, leading to considerable learning. Competitive Cost:Our pen is priced competitively and you don’t have to break the bank to purchase it. Note:All the 3D pens are heat when they are used for a long time.Under 8-year-old children should be accompanied by the use of adults. ✎【Advanced Technology】This 3d pen kit is equipped with advanced unclogging mechanism technology to prevent jamming. This also makes maintenance more convenient. So, for those who hate the maintenance part, it is effortless with our 3D printer pen. ✎S【Tep-less Speed Control】This is for easier control of the pen.With our pen,you just have to slide down or slide up the control to speed up or slow down or achieve a speed in between. ✎【Adjustable Temperature】Much like the speed, an adjustable temperature is important in this device, especially that this pen allows us to use PLA and ABS materials. We find this feature very helpful and smooth to use. 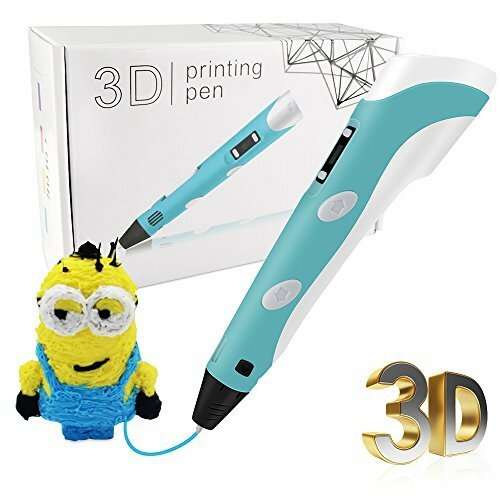 ✎【3D Pen With LCD Screen】Different materials need different temperatures to melt, that’s why adding an LCD screen makes it so much easier for the user. You need not wonder about the material or temperature with this pen anymore. ✎【User-Friendly】This product is designed to be Fitted comfortably and naturally in the hands.It is safe for children 8 years old and above and is packed with useful attributes to make the process more enjoyable and convenient. 3D Printing Pen, which can be used to draw a 3D project to bring your designs from paper to real life. The 3D printing pen is suitable for children over 6 years old and adult. Used by children must be under tutelage of adult. PCL FILAMENT: This 5th generation 3D printing pen uses PCL Filament. The PCL Filament of melting has a lower melting point with non-toxic, no fumes or odors which means in a safer environment, especially when used around children. ADJUSTABLE SPEED: Adjustable feed lets you regulate speed and flow for optimal control of material while you’re drawing. LOW TEMPERATURE: 3D drawing pen designed with aviation ceramics nozzle, temperature is adjustable in 1 degree increments from 60 to 100¡æ, for optimal fine- tuning. Low temperature mean more safety, won’t hurt the skin. LED DISPLAY: Large LED display can directly show the information like supplies type, speed, temperature, warning, more humanized display interface. 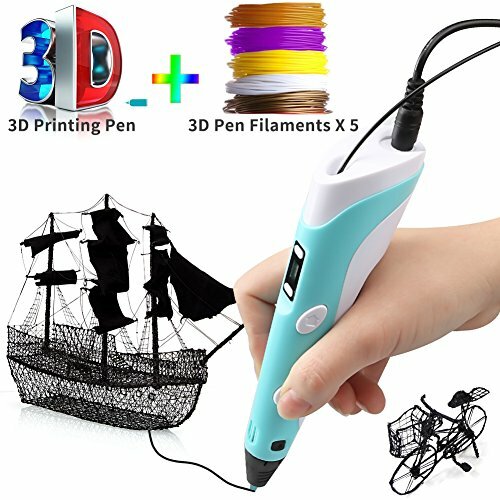 PERFECT 3D PEN FOR KIDS AND ADULT: 3D doodler pen can be as Christams or birthday create gift or Toys or Tools for children, friend, adult to dimensional graffiti and painting. 3D printing pen is perfect for children above 6 years old and adult no matter you are artists, hobbyist or creative lovers.